1. Treat linked activities as a purposeful system. 2. Declare worldviews which make purposeful models meaningful (there will be many!). 3. Enact SSM as a learning system, finding accommodations enabling action to be taken. 4. Use models of activity systems as a base for work on information systems. Treat linked activities as a purposeful system. SSM is based upon a single concept: that we model systems of purposeful human activity (what people do), rather than data-processing or IT systems (how IT components should function to support what people do). It is systemic, rather than systems-focused, calling upon the tradition of general systems theory (von Bertanlaffy, 1968) and inquiring systems (Churchman, 1971) in acknowledging the disparate elements of a situation. SSM is helpful for analysis approaches that wish to understand the connections, conflicts, and discrepancies between elements of a situation rather than attempting to subsume all elements into a single perspective. However sophisticated the models become and whatever models we use (SSM, UML, DFDs, Entity-Relationship diagrams, etc.) we should always remember that a model is a reduced “window” onto the real world. Whatever insights a model may give us, it does not represent the real world. 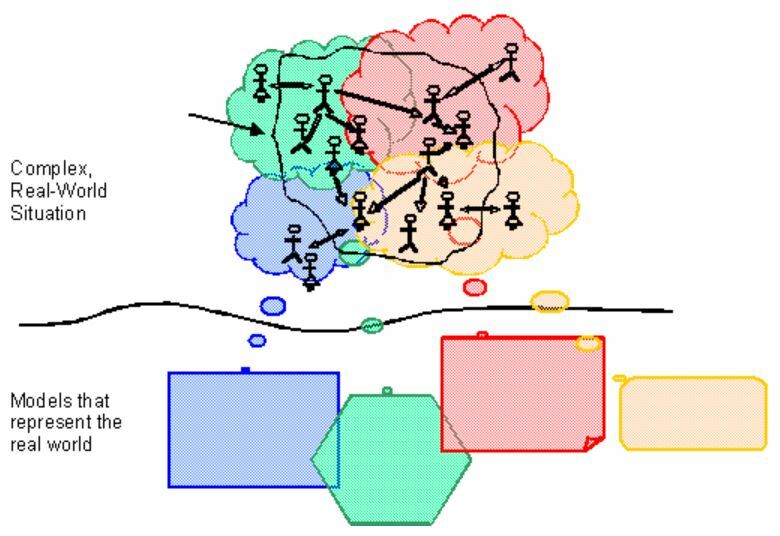 Instead, it represents systems thinking about the real world – separated out perspectives, which model subsets of activity that are related to a specific purpose or group of participants in the problem situation. The important thing is to examine each transformation from one perspective: you can happily repeat the exercise using another perspective, to see if you can integrate the two (sometimes this may not be possible, for example, how do you integrate the needs of drivers in transformation (1) with the needs of pedestrians?). If you cannot integrate competing perspectives, you must take a decision about whose perspective will have priority – this is where your client’s objectives come into play. In every change, there are winners and losers; your job is to make it explicit who loses and who wins! Customer: Who is the system operated for? Who is the victim or beneficiary of this transformation-system? Actor(s): Who will perform the activities involved in the transformation process? The actors represent a set of people who are acting in concert to achieve a specific purpose. Actors also define the system boundary – who is inside or outside the system, from this perspective. Transformation: What single process will convert the input into the output? The transformation defines the system purpose. If you have multiple verbs, this normally indicates that you are confusing or conflating two or more purposeful system views. aka Worldview: What is the view which makes the transformation worthwhile? Understanding this element communicates the how, what, why (context) of this system model. Environment: What are the constraints (restrictions) which may prevent the system from operating? What needs to be known about the conditions that the system operates under? The purpose of SSM is to produce structured models that help in our thinking about the real world. But it is important to understand that these do not represent the real world. SSM is a process of analyzing subsets of human activity, to understand this activity at a deep level and to suggest ways of acting that improve the current “problem-situation”. It is not a way of modeling systems of work as they exist, or of defining computer-system functions. Rather, it is a way of engaging in joint learning about a real-world problem situation with participants in that situation, to explore relevant perspectives on its purposes, processes, and what needs to change. Systems thinking attempts to understand problems systemically. Problems are ultimately subjective: we select things to include and things to exclude from our problem analysis (the “system boundary”). But real-world problems are wicked problems, consisting of interrelated sub-problems that cannot be disentangled — and therefore cannot be defined objectively (Rittel, 1972; Rittel & Webber, 1973). The best we can do is to define problems that are related to the various purposes that participants pursue, in performing their work. by solving one problem, we often make another problem worse, or complicate matters in some way. So systemic thinking attempts to understand the interrelatedness of problems and goals by separating them out. In understanding different sets of activities and the problems pertaining to those activities as conceptually-separated models, we understand also the complexity of the whole “system” of work and the interrelatedness of things – at least, to some extent. In much of his later work, Checkland addresses the difficulty of converting a model that represents a system of human activity into a set of requirements for an IT-based information system by distinguishing between the supporting system (IT) and the supported system (human activity). The supported system represents the problem domain, the amalgam of purposeful systems of human activity that underpins the problem situation. 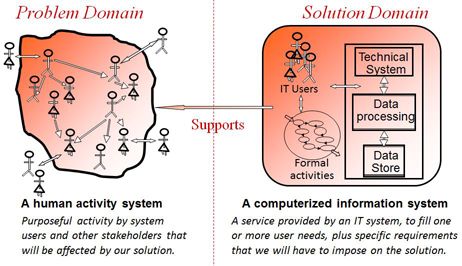 The supporting system represents the solution domain, that combination of people, processes, and technology that provides a solution to problems identified by participants in the problem situation. Soft Systems Methodology (SSM) was devised by Peter Checkland and elaborated in collaboration with Sue Holwell and Jim Scholes — among others — at Lancaster University in the UK. 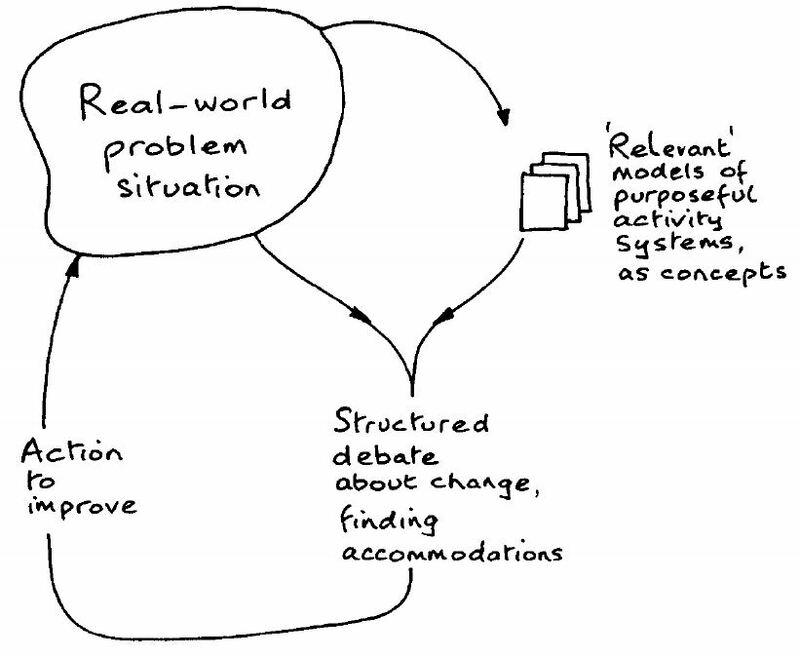 SSM provides a philosophy and a set of techniques (a method) for investigating a “real-world” problem situation. SSM is an approach to the investigation of the problems that may or may not require computer-based system support as part of its solution. In this sense, SSM could be described as an approach to early system requirements analysis, rather than a systems design approach. While the original, seven-step method of SSM (Checkland, 1979)has been replaced by more nuanced approaches to soft systems analysis (note the loss of the word “method”). Checkland now considers the approach more of a mindset, or way of thinking than a strict set of steps that should be followed (Checkland & Holwell, 1997). However, without the seven stages of thinking, it can be difficult to understand where to start. For this reason, many of the pages that follow employ the terminology and approach of the seven-stage method originally proposed. This website attempts to explain some of the elements of SSM for educational purposes. It is not intended as a comprehensive source of information about SSM and may well subvert some of Checkland’s original intentions, in an attempt to make the subject accessible to students and other lifelong learners … . Checkland, P. (1979) Systems Thinking, Systems Practice. John Wiley and Sons Ltd. Chichester UK. Latest edition includes a 30-year retrospective. ISBN: 0-471-98606-2. Checkland, P., Poulter, J. (2006) Learning for Action: A Short Definitive Account of Soft Systems Methodology and its Use, for Practitioners, Teachers and Students. John Wiley and Sons Ltd. Chichester UK. ISBN: 0-470-02554-9. Rittel, H. W. J. (1972). Second Generation Design Methods. Design Methods Group 5th Anniversary Report: 5-10. DMG Occasional Paper 1. Reprinted in N. Cross (Ed.) 1984. Developments in Design Methodology, J. Wiley & Sons, Chichester: 317-327.: Reprinted in N. Cross (ed. ), Developments in Design Methodology, J. Wiley & Sons, Chichester, 1984, pp. 317-327. Rittel, H. W. J. and M. M. Webber (1973). “Dilemmas in a General Theory of Planning.” Policy Sciences 4, pp. 155-169.